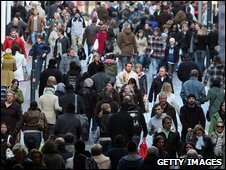 BBC NEWS | Business | Will banks split affect customers? An academic recently concluded that people were four times more likely to change their husband or wife than change their basic bank account. David Llewellyn, professor of money and banking at Loughborough University, was highlighting our inertia when it comes to changing our current account. This may be easing, partly as customers become more comfortable using internet-based accounts. But will the formation of new High Street banks by breaking off parts of the government-backed giants of today encourage more people to shop around for banking? Over the next few years, RBS and Lloyds are set to sell off chunks of their businesses and these may well be sold to new entrants to the banking sector. Customers banking with these sold-off sections would, in time, receive a letter telling them their account is being run by another banking group. They need not do anything, but they are always free to switch bank. Mortgage customers' terms would remain the same, but again they are free to shop around when they review their home loan. Chancellor Alistair Darling has said there could be three new High Street banks in the UK over the next three to four years as a result. Customers could see a series of new names - or a resurrection of old names - on the High Street and at least a little more competition. Under the plans announced, RBS will sell 318 branches while Lloyds is set to dispose of more than 600 branches over the next four years. "One of the many lessons we have to learn is keeping a very rigorous eye on competition available on the High Street," Mr Darling told the BBC. This meant new entrants would come from outside the traditional banking sector. So, with bank branches up for grabs, we can expect to see newcomers such as Virgin and Tesco on the High Street, as well as overseas banks without a UK branch network vying for custom. Professor Llewellyn says that while more brands should be "beneficial in principle" to customers, small banks could be restricted in what they offer to customers. "It is difficult to argue that the consumer would lose," he says. Some of these customers will also be small shareholders, and for them the position looks a bit grim at present. Both banks' share prices at 1000 GMT were well below the level that the government paid when it bailed out the banks. After the announcement, shares in RBS fell 1.4% to 38 pence. Lloyds was up 5.9% at 90p, but still below the 122.6p paid by the government. Even if these banks have to sell chunks of their businesses, a large body remains which controls a significant amount of mortgage lending and savings products. This would mean that the newcomers are still unlikely to be able to compete on price, especially in the short term. Historically, there has not been much of a battle over this anyway. Instead, banks would battle for custom by providing good customer service, offering good terms on loans, or perhaps just by providing a different option for disgruntled customers. But, rather than tackling big names head-on and ultimately being swallowed up, the newcomers might just settle into the "current rules of the game" and hardly compete at all, Professor Llewellyn admits. You might think that this would spell trouble for smaller building societies, but Adrian Coles - director general of Building Societies Association (BSA) - says they will welcome "fairer" competition. "It is unacceptable that Lloyds has 30% of the mortgage market and is 43% government-owned. We would be pleased to see that situation coming to an end," he says. "We would welcome the break-up of huge nationalised banks." Competition has already shrunk, with a number of mergers in the sector, but the banking crisis shows that there is no direct correlation between an institution's size and its success, he says. Greater competition would also be welcomed by the British Bankers' Association, which represents the banks. It says that customers are already getting a good deal from their banks. "The UK has a highly competitive retail banking sector already offering greater customer choice than in many other countries," it says in a statement. "The BBA has always welcomed competition for High Street banking services and choice for customers." But consumer groups, such as the consumers' association Which?, say that even at times of high competition, customers have been let down in the way they are treated by their banks - from overdraft fees to dealing with complaints. "The big banks are almost always at the bottom of the pile for customer service in our satisfaction surveys. If banks were genuinely competing with each other for business, then you would expect them to be much better at keeping their customers happy,"
"Greater competition should spur banks into working harder to keep their customers satisfied, which is good news for consumers." New brand names above the doors of old branches could cause some customers to sign up with the institution which has the branch closest to their home or work. 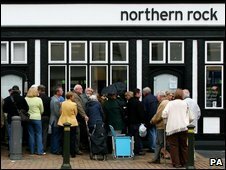 Yet, in five years time, we can still expect the traditional High Street banks still to be serving the most customers - although the look of that High Street might have changed somewhat. Spanish bank Santander is rebranding all of the old Bradford & Bingley, Alliance & Leicester and Abbey branches in its own image by the end of 2010, and at least one or two new bank names will emerge. Makes you think it could be a good time to be a bank signwriter.